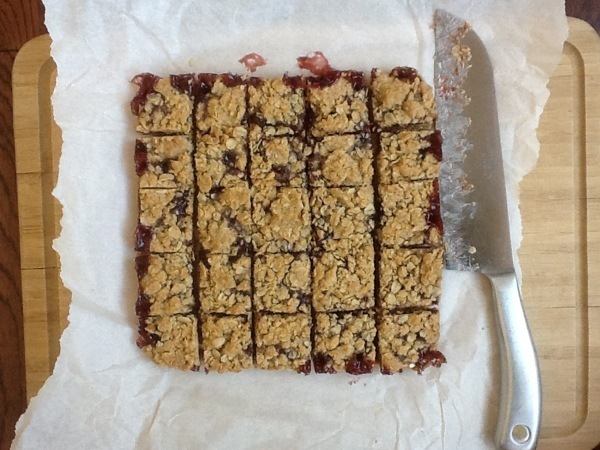 Raspberry Oatmeal Cookie Bars | One Picture, A Million Words. Lana, my daughter, attended a PTA-organized picnic this afternoon at our neighbourhood park to mark the end of the school year and these cookies were our contribution. The recipe can be found on the popular Allrecipes.com and has a whopping 896 reviews giving it an average rating of 4.5 out of 5 stars. With such stellar credentials, how could I not make it? However, the main draw of these delicious cookies for me is the fact that they can be put together with such ease and so few (and basic) ingredients. The weather lately has been nothing short of awful and we received the go-ahead email only a couple of hours before the scheduled picnic. Within 30 minutes, I managed to slide the tray of cookies into the oven. They were that easy to make. Bar cookies are always on the top of my list when I need to bake a treat to serve a crowd. You make one dough, pack it in a tin and bake it off before slicing the whole thing into dainty little squares for your guests. A much, much more efficient and stress free way of baking for a party if you ask me. If you’ve ever baked a batch of cookies you will know what I mean. Go ahead and make these cookies. The numbers don’t lie. They were a hit with the kids. Another plus point with these cookies is that they are sturdy and pack up very nicely for a picnic. Lana really liked them.